Looking for a magician's table? Here at AmazeKids and Vanishing Inc. we have the world's most popular table for professional magicians, clowns, and variety entertainers -- now with a convenient, new, retractable suitcase-style handle! Click on the video above and take a guided tour of the table. 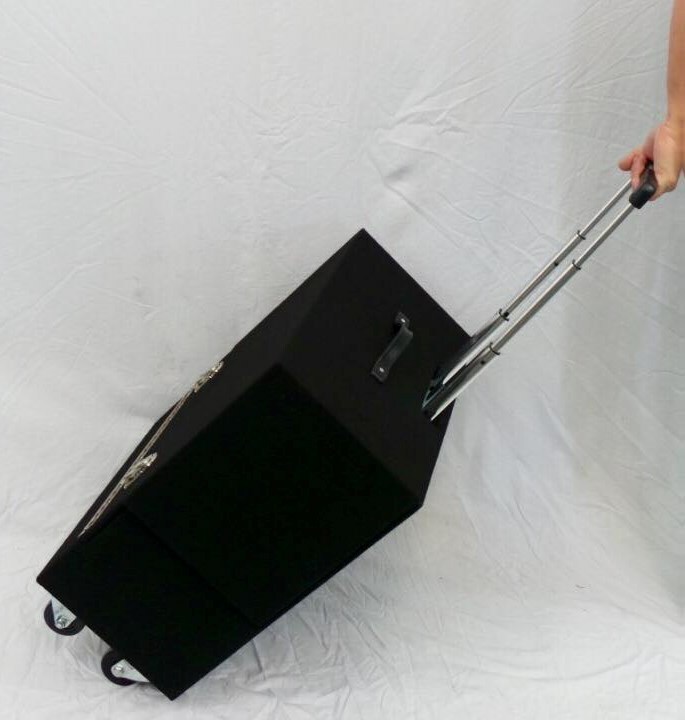 Our partner, Showtime Magic Productions makes the Joe Lefler Pro Suitcase Table with the retractable handle. This is so much easier to roll from your car to your client's venue. This high quality, precision-crafted table is based on Joe Lefler's original innovative design. It's an investment that will carry and protect your props for years to come while making you look your best when stepping in front of an audience -- whether in a living room, backyard, or corporate event. It's versatile design is perfected from over 25 years of real-world feedback from thousands of satisfied customers. Four 3 inch (8 cm) casters with quiet non-marring rubber feet.Rolls over rough surfaces easily. At checkout, choose the right size and color for you: Large or Small. Solid Black, Charcoal Gray, Royal Blue or Deep Red. Because these are custom-made when you place your order, expect your order to ship within six weeks. When you get the Joe Lefler Pro Suitcase Table with the Retractable Handle you'll look like, perform like, feel like and wheel it like a pro.